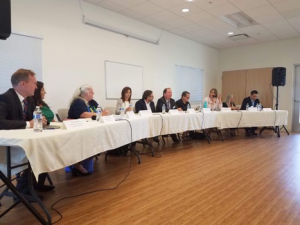 The Utah Housing Coalition (UHC) hosted its first congressional panel on affordable housing under the banner of the Opportunity Starts at Home multi-sector affordable housing campaign. (UHC is one of the seven state grantees of the national campaign.) The panel focused on the deep intersections between housing, hunger, education, and healthcare in urban and rural Utah. The event engaged residents, local policy experts, and bipartisan candidates for Congress. UHC now has a formula for a “forum in a box” to talk about housing and its multi-sector connections with elected officials, candidates, policy experts, and the broader community throughout the state. The original intent behind the event was to find a way for residents to engage in civic issues. Voter apathy exists across the state, both in terms of voter turnout and voter awareness the positions of elected officials and candidates for public office at every level. This forum was designed to bridge that gap by offering an opportunity to dialogue with candidates on key issues and on their experiences as Utahans. When residents have more opportunities to engage with candidates, they better understand the policy process and are more involved in affecting policies that impact them and their communities. A second goal of the event was to educate elected officials and candidates about the reality of the affordable housing crisis in Utah and its spillover impacts on other areas of people’s lives. The event allowed UHC and residents to articulate these messages to current and prospective policy makers; in attendance at the event were current U.S. Representatives Chris Stewart (R-2nd District) and John Curtis (R-3rd District) and candidates running for Utah’s second, third, and fourth congressional districts. The Utah Housing Coalition was also intentional about including local panelists with lived-experience, such as a resident of a senior assisted living housing project and a resident who is receiving a Housing Choice Voucher. Four multi-sector policy experts also served as panelists: Gina Cornia from Utahns Against Hunger, Jay Blain from the Utah Education Association, Alan Pruhs from the Association for Utah Community Health Centers, and Michele Weaver from the Rural Community Assistance Corporation. Given the event’s success, UHC is considering replicating this type of forum at local community levels as well, such as with local school board officials. They now have a format that can be deployed across the state. UHC will improve on the model by finding additional ways for public housing residents to participate and engage directly with elected officials and candidates.